Buy any 3 or more products, save 10% on each! ATCC has been the premier source for microbial reference strains since 1925, placing the highest standards on producing quality materials you can depend on for reproducible results. Choose from among the world’s largest collection of bacteria, viruses, yeast, fungi, protozoa, nucleic acids, and molecular tools. The ATCC Cell Biology Collection is the largest and most diverse collection of its kind. Browse our selection of continuous, hTERT-immortalized, primary and iPS cell lines as well as our selection of culture media and associated reagents. We have everything you need to keep your cultures healthy and your research moving forward. 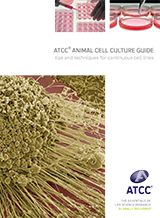 ATCC was entrusted with its first cell line in 1962 and has consistently attained the highest standards and used the most reliable procedures to verify every cell line since. The ATCC Cell Biology Collection is one of the largest bioresources in the world, and offers a complex array of human, animal, insect, fish and stem cell lines from which to choose. Human primary cells more closely mimic the physiological state of cells in vivo and generate more relevant data representing living systems. 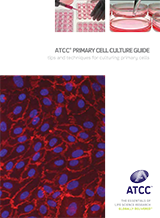 ATCC Primary Cell Solutions consist of quality cells, reagents matched and optimized to work with each ATCC primary cell type, relevant information summarized in ATCC Primary Cell Culture Guide, and tips and techniques at your fingertips. STR profiling aids in the detection of misidentified, cross-contaminated, or genetically drifted cells, which invalidate research results. ATCC offers complete cell line authentication service utilizing Short Tandem Repeat (STR) profiling. STR profiling aids in the detection of misidentified, cross-contaminated, or genetically drifted cells, which invalidate research results. STR profiling is a rapid, reproducible, and standardized PCR-based method for the authentication of human cell lines. ATCC’s STR report meets requirements for funding, publication, and quality control. ATCC trained experts amplify 17 STR loci plus Amelogenin using Promega’s PowerPlex® 18D System. A comprehensive analysis interprets both karyotypically normal and abnormal cell lines. A no-fuss sample mailer packet is provided with which cells are spotted onto paper and mailed to ATCC using the pre-addressed envelope. Note: This offer is not valid in conjunction with contract discounts or any other special pricing. Void where prohibited. Some exceptions apply, not all ATCC SKU’s are valid under this promotion. This offer does not apply to ATCC services.